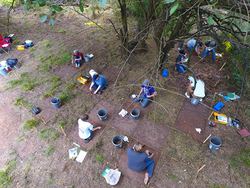 Stephen F. Austin State University anthropology students spent five weeks excavating Millard's barn as part of SFA's field methods in archaeology course. The course provides students with the opportunity to participate in tangible excavations and research. Photo credit: Linda Bratcher and Katherine Coleman. NACOGDOCHES, Texas - Anthropology students at Stephen F. Austin State University had the opportunity to get an up-close and personal look at "Texas' Oldest Town" as they spent this summer excavating one of Nacogdoches' historic areas. Students who participated in SFA's field school with Dr. Leslie Cecil, chair and professor of the Department of Anthropology, Geography and Sociology, spent five weeks excavating the historic Millard barn. This is the first time the farmstead was excavated. The research project's primary goal was to document the existence of the barn while attempting to discover as much as possible about the area. The information obtained will be used to further record Nacogdoches' history from the 1830s to1860s. "The focus of this research was to learn more about the Millard family and how they lived during the mid-1800s," Megan Zewe, SFA anthropology student, said. "The excavation is important because it allows us to learn about the city's past in a way that is more real and in-depth than a textbook." Archaeology field school is a required course for students with an anthropology emphasis and interest in archaeology. This summer's field school students participated in all stages of the excavation and conducted their own lab work. Each student was responsible for excavating one small plot while working alongside Cecil and other anthropology professors. According to Cecil, a secondary goal of the course is to provide students with the necessary experience for graduate school and employment in the field. "The purpose of field school is to give students interested in archaeology hands-on experience in the field to see if this is really what they want to do," Cecil said. "Since so much of an archaeologist's work is outdoors, it makes sense to spend some time in the heat among the bugs and dirt. Although lab work is essential to the profession, it's the work in the field that is fundamental." Cecil said future field school classes will continue the work and research conducted this summer. Excavations through 2020 will expand to include the main house and perimeter of the crib barn.